Tell someone you're heading to the Hunter Valley for the weekend and they'll immediately assume you're going wine tasting. To be fair that's a pretty safe assumption to make, as Australia's oldest wine producing region is home to more than 150 wineries. But while the areas around Broke and Pokolbin in the Lower Hunter are the most popular spots for Sydneysiders looking for a weekend getaway, there are plenty of gems to be found if you look further afield. Continue deeper into the Hunter region for a quieter and even more laid-back holiday. Boasting gently rolling green hills and rugged peaks, the area also features an interesting rural history and a laid-back approach to life. In sleepy towns like Vacy, East Gresford and Paterson, you'll find a relaxed vibe and quaint little cafes and restaurants. There are walking trails to explore, as well as plenty of good driving to be enjoyed along winding country roads. Once you've tired of the scenery, enjoy a good old-fashioned pub lunch at the Hotel Beatty in East Gresford. Don't expect to go home hungry. Bunna Bunoo Olive Grove is a family-managed olive grove on the banks of the Paterson River. Say hi to the canine welcoming party when you arrive and then head inside to sample an extensive variety of olives, oils, chutneys, sauces and tapenades. Hamilton Lund; Destination NSW. 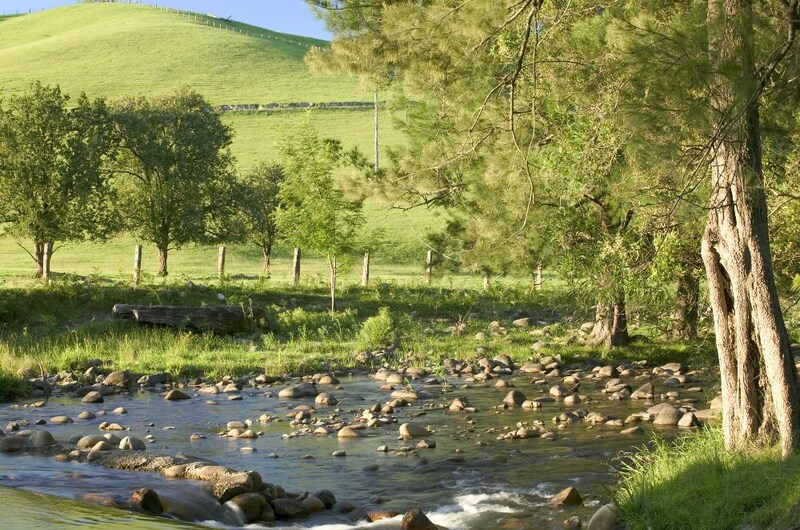 Beautiful Barrington Tops National Park is only a short drive away. Of course, just because you've strayed a little way away from the Hunter Valley's main wine region doesn't mean you have to go without sampling a drop or two. Camyr Allyn Wines is set in lush grounds near East Gresford. Situated on the banks of the Allyn River, this family-run winery has a cellar door open every day except Tuesday. There's a friendly atmosphere where any questions you may have are answered, and you can pick up a bottle or three to take home with you. The sparkling rose was my personal favourite. There are plenty of accommodation options in the area, but one of the best would have to be Cabins in the Clouds near Vacy. Sitting right at the top of a secluded mountain, the three cabins offer impressive views out across the rolling fields below. It's a private, quiet resort with a swimming pool and tennis court. Sit out on your deck as the sun goes down, enjoy a drink or two and watch eagles soaring skywards on unseen currents driving up from the valley below. A couple of cabins even have outdoor hot tubs with enviable views to give you the full relaxation experience. To find out more about planning your weekend away to the Hunter region, the Gresford NSW website is as good a place as any to start.